If you’re an established brand, the headlines may feel pretty ominous these days. Such dire headlines suggest Millennials are in a branding-and-marketing class all their own: less brand loyal, more prone to switch brands, and more open to private labels. But a recent Field Agent survey could suggest differently. 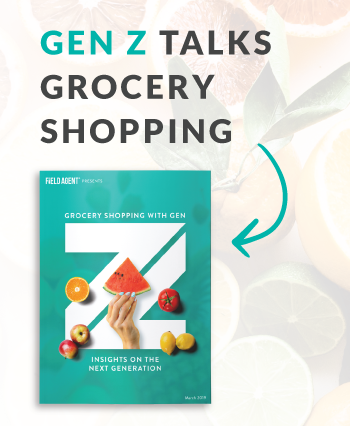 Last night, retail-auditing and insights firm Field Agent surveyed 1,959 shoppers*—905 Millennials and 1,054 Non-Millennials—about their attitudes and shopping habits toward brands, specifically in the packaged grocery and household consumable** categories. Our aim was to illuminate, potentially, the similarities and/or differences between Millennials (ages 18-35) and Non-Millennials (36+). *All respondents were U.S. adults at least 18 years of age who own smartphones. The survey was administered through the Field Agent mobile app. **"Household consumables" include any non-grocery, non-durable goods like cleaning supplies, detergent, toilet paper/paper towels, pet supplies, baby supplies, personal care items, OTC medications, air fresheners, etc. Are shoppers today looking for a committed relationship with a single brand (among packaged groceries and household consumables), or do they prefer to, you know, date around? The small majority, then, wants a loyal relationship with one brand. But what’s most striking is this: Broken down by generational category, the results are remarkably similar for Millennials and Non-Mills. Fifty-six percent of Millennials, compared to 59% of Non-Millennials, prefer staying true to one brand over time as opposed to shopping around. Of course, when it comes to discussions about brand loyalty, no two product categories are created the same. So Field Agent assembled a theoretical basket of six common “grocery store” goods and asked shoppers to rate how loyal they are to a single brand in each category. As you can tell from the graph below, in practically each category, Millennials and Non-Mills are more alike than different. For the same basket of goods, we also asked respondents to identify the categories in which they have switched from one primary brand to another primary brand over the past three years. 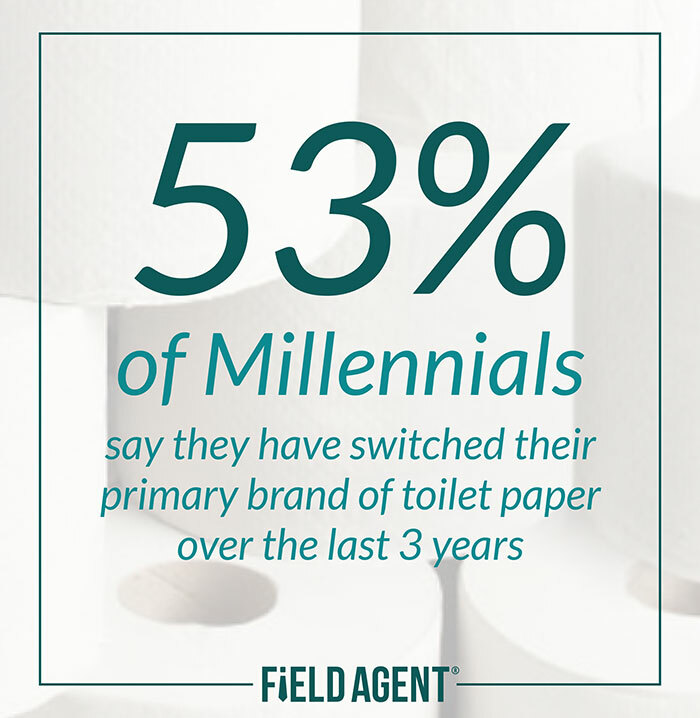 In only one category, toilet paper, did more than half of shoppers—in this case all Millennials—say they’ve switched primary brands over the past three years. Yet, once again, it’s the similarities between Millennials and Non-Millennials that constitute the real storyline. As the graph shows, although there are meaningful differences between product categories, the differences between Millennials and Non-Millennials are comparatively negligible. Even when you question shoppers about their favorite brand names...Millennials and Non-Millennials come out looking markedly similar. 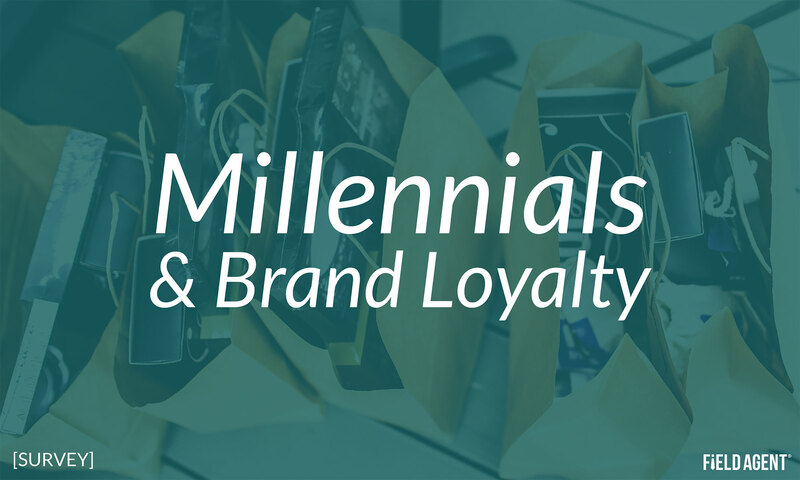 Field Agent asked respondents to "identify one brand to which you're extremely loyal," across three different categories. This was a free form question, meaning no choice options were imposed on respondents. Significantly, Mills and Non-Mills identified many of the same brands, and their top three brands per category are almost identical, as you can see in the infographic. 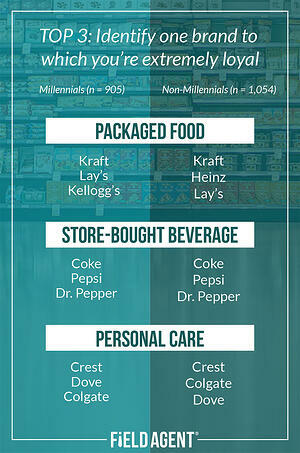 It's important to note: Millennials, like Non-Millennials, primarily cited established, conventional name brands—the Crests, Cokes, and Krafts of the world—as those to which they're most loyal. It appears there may be more differences among Millennials than between Millennials and Non-Millennials, suggests Field Agent’s survey of almost 2,000 shoppers. Instead of finding weaker brand loyalty among Millennials, this mobile survey implies our assumptions about this important class of shopper may not be entirely accurate. Want More Insight on Brands? Based on surveys with thousands of shoppers, Brand New World: Exploring the Critical Issues Facing Today's Brands, takes an intense, data-driven look at the contemporary branding landscape. Download this free report today…and start exploring the “brand new world” around us!